Following the submission of the second Palestinian ad hoc declaration in 2014, the Office of the Prosecutor opened a preliminary examination into the situation in Palestine. During preliminary examinations, the Prosecutor employs a four-tier filtering mechanism to determine whether the examination could proceed into investigation or not. The examination on the situation in Palestine, similar to others, requires a determination on issues of jurisdiction, admissibility and interest of justice. This chapter, therefore, examines these issues in light of, among others, the practice of the Office of the Prosecutor and the Rome Statute. In view of the situation in Palestine, it covers temporal, material, territorial and personal jurisdiction, followed by a discussion of the fundamental concepts of complementarity and gravity to determine the admissibility of potential cases before the International Criminal Court. 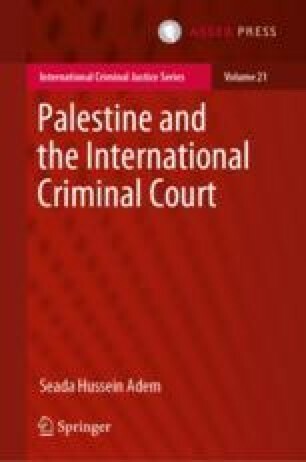 Similar to other considerations, the chapter concludes that the last pre-investigation consideration, namely ‘interest of justice’, is also satisfied in the context of Palestine. Abrams E (2015) Amnesty International, Human Rights Watch, and the question of Hamas, Gaza, and Israel. https://www.cfr.org/blog/amnesty-international-human-rights-watch-and-question-hamas-gaza-and-israel. Accessed 20 September 2016. Erakat N (2014) Humanitarian law and Operation Protective Edge: A survey of violations and remedies. https://www.files.ethz.ch/isn/183320/738d0446fdfbae889f723f019683c6b3.pdf. Accessed 20 September 2016. Hayner P (2013) Libya: The ICC enters during war. https://www.ecfr.eu/ijp/case/libya. Accessed 20 September 2016. OTP (2005) First report of the Prosecutor of the International Criminal Court, Mr Luis Moreno Ocampo, to the Security Council pursuant to UNSCR 1593 (2005). https://www.icc-cpi.int/NR/rdonlyres/71FC0D56-11FC-41B9-BF39-33FC54F2C2A1/223633/ICCOTPST20080605ENG6.pdf. OTP (2007) Policy paper on interests of justice. https://www.icc-cpi.int/NR/rdonlyres/772C95C9-F54D-4321-BF09-73422BB23528/143640/ICCOTPInterestsOfJustice.pdf. Accessed 20 September 2016. OTP (2013a) Code of conduct for the Office of the Prosecutor. https://www.icc-cpi.int/iccdocs/PIDS/docs/Code%20of%20Conduct%20for%20the%20office%20of%20the%20Prosecutor.pdf. Accessed 20 September 2016. OTP (2013b) Policy paper on preliminary examinations. https://www.icc-cpi.int/iccdocs/otp/OTP-Policy_Paper_Preliminary_Examinations_2013-ENG.pdf. OTP (2014) Situation on registered vessels of Comoros, Greece and Cambodia: Article 53(1) Report. https://www.icc-cpi.int/iccdocs/otp/OTP-COM-Article_53(1)-Report-06Nov2014Eng.pdf. Accessed 20 September 2016. OTP (2015a) Report on preliminary examination activities. https://www.icc-cpi.int/iccdocs/otp/OTP-PE-rep-2015-Eng.pdf. Accessed 20 September 2016. OTP (2015b) Strategic plan: 2016–2018. https://www.icc-cpi.int/iccdocs/otp/EN-OTP_Strategic_Plan_2016-2018.pdf. Accessed 20 September 2016. OTP (2016) Report on preliminary examination activities https://www.icc-cpi.int/Pages/item.aspx?name=161114-otp-rep-PE. Accessed 20 September 2016. Seils P (2014) Intolerance of impunity does not make ICC an enemy of peace. https://www.opendemocracy.net/openglobalrights/paul-seils/intolerance-of-impunity-does-not-make-icc-enemy-of-peace. Van Schaack B (2011) The principle of legality in international criminal law. Santa Clara University Legal Studies Research Paper 10-08. https://ssrn.com/abstract=1657999. Yesh Din (2011) Alleged investigation: The failure of investigations into offenses committed by IDF Soldiers against Palestinians. https://www.yesh-din.org/en/alleged-investigation-the-failure-of-investigations-into-offenses-committed-by-idf-soldiers-against-palestinians. Accessed 25 May 2017.